One listen to The Last Vegas's 'Whatever Gets You Off' and you realize this band has little memory of the last 20 years. Grunge, nu-metal, metalcore, alt rock never happened. What happened is below-the-belt, kickass rock and roll continued, even if GNR didn't. 'Whatever Gets You Off' was recorded in Los Angeles and produced by veterans DJ Ashba (Motley Crue), Marti Frederiksen (Aerosmith, Motley Crue, Ozzy) and Nikki Sixx after being hand-picked by Motley Crue as part of Guitar Center's On-Stage program. The Last Vegas is the real deal: swaggering, streetwise, and rowdy rock and roll steeped in the best 80's tradition made fresh for this generation. Everything about 'Whatever Gets You Off' rings true, from the lusty gutter vocals of Chad Cherry to top-down driving rhythm section to the buzzsaw riffs and lightning solos. The music propels, entertains and best of all swaggers with best intentions: get you up and rocking. The Last Vegas is at their most rowdy and melodic on 'Whatever Gets You Off' and 'I'm Bad;' heavier, raw and just damn loud on 'High Class Trash' and 'Another Lover;' ambitious and unrelenting in pace and performance on 'Outta My Mind;' straight from Sunset Boulevard and the Whiskey on 'Loose Lips' and the ballad 'Apologize' that will make fans of Poison droll. Indeed, The Last Vegas's 'Whatever Gets You Off' is first-class American rock and roll: rowdy, raw and just plain dangerous. Don't miss out on the fun! Highly recommended! 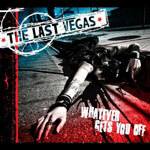 The Last Vegas's 'Whatever Gets You Off' is first-class American rock and roll: rowdy, raw and just plain dangerous. Don't miss out on the fun!